Sciatica – The Cause Of Your Back And Leg Pain? By admin , in Sciatica on January 27, 2019 . 1.1 What are the main causes and symptoms? 1.1.1 Who does it affect? 1.1.2 How can it be prevented? Sciatica is not a disease, but the term used to describe a number of conditions associated with or near the sciatic nerve. The sciatic nerve, the largest and longest nerve in the human body, starts in the lower part of the back, also known as the lumbosacral spine. This nerve, along with all its nerve branches, is ¾ inch in diameter and extends from the lower back to the back of the foot, and is responsible for the sensory and motor functions in the thigh, knee, calf, ankle, feet and in the toes. When back problems put pressure on this nerve, the result is pain in the lower back, buttocks, hip, and back of the leg and possibly, all the way down to the toes. Although it’s usually only on one side of your body and starts in your lower back, it can easily affect your thighs, calf, foot or your toes. Many people don’t fully understand what sciatica is, and don’t realize they are sufferers of this condition because of where the pain is located. The majority of their pain may be in their thigh or calf and they naturally assume that they have a problem with their legs rather than the sciatic nerve in their back. In some situations, the pain or numbness may go away on its own, but it often needs to be treated with medicine, exercises or even surgery. What are the main causes and symptoms? 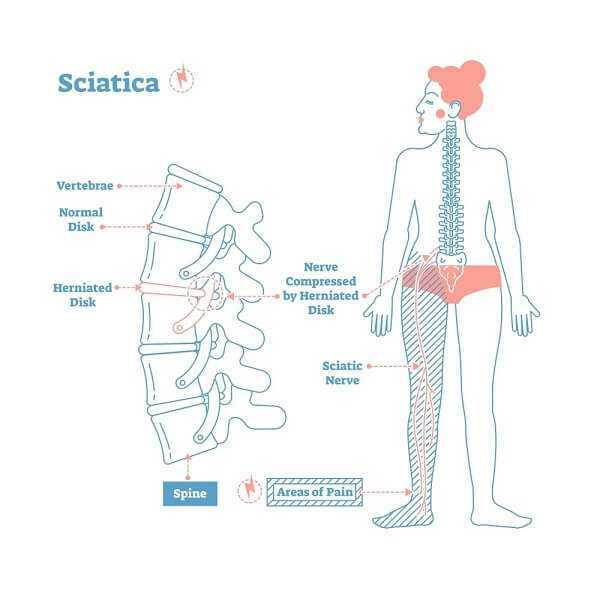 Although the root cause of sciatica pain is somewhat difficult to determine, the most common causes are quite varied and include: pelvic fracture, ruptured intervertebral disc, spinal stenosis, tight hamstrings, tight buttock muscles, joint and muscle problems in the spine or pelvis, different leg lengths, and back sprain. Some of the symptoms associated with this are slight changes to what you feel in the back of the thigh, calf or sole of your feet. The feeling may be painful; burning, tender, sharp, shooting, dull feeling, “pins and needles”, or an electrical sensation, and usually occurs on only one side of the buttocks and/or leg. Any sensations that are abnormal may be signs of this condition, especially if they are mixed with pain. The pain may start minor, and become severe or vice versa. In some of the more severe cases, the patient may experience an inability to move their feet or bend their knees, along with having trouble walking. Patients are usually diagnosed after seeing a doctor for pain in the lower back that extends downward. The doctor will first run blood tests, take X-rays and may add MRIs or EMGs. Nerve conduction tests to determine nerve damage may also be ordered. Click “Information on Sciatica” for more information. Men may experience sciatica more often than women due to the fact that many men carry their wallets in a hip pocket, the exact spot where the sciatic nerve is located in the buttocks. Sitting on the wallet can cause pressure on the nerve and cause the pain. 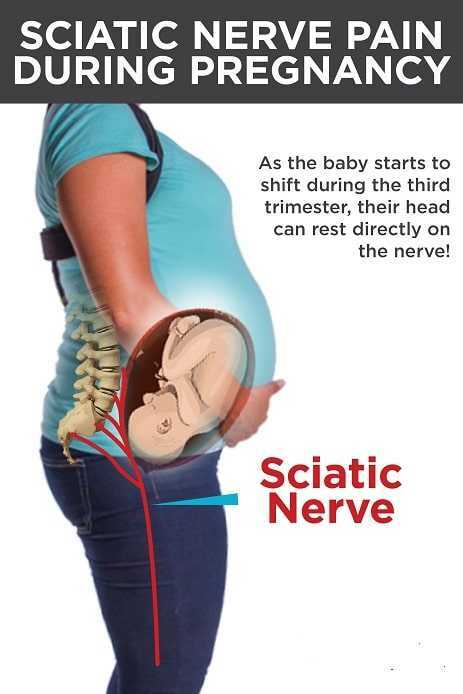 However, women oftentimes will suffer from Sciatica during pregnancy, due to the quick growth of their unborn child and subsequent weight gain. You can prevent sciatica by minimizing your sitting in a constant position for extended periods and by following a regular exercise program that includes gentle stretching exercises, such as yoga. Which Sciatica Exercises Can Help Relieving My Pain ? If your job requires you to sit all day, be sure to get up and walk around for a few minutes at least every hour. Men should remove unnecessary items from their wallets and even better, do not carry your wallet in your hip pocket! Practice correct posture while sitting and standing, and pay close attention to your sleeping position. Ensure that your pillow is the appropriate height; not too low or too bulky. Sleep on your back with another pillow supporting your knees, or on your side with a pillow in-between your knees. Exercise, chiropractic and massage therapy can also help to lessen your pain, plus they will also reduce your chances of having recurring flare-ups in the future. There are many treatments for sciatica pain to help deal with it, from home remedies to surgery. Because most people don’t want to have to endure a painful surgery, home remedies and other forms of therapy are oftentimes used for the treatment of sciatic pain.